I’d first met Richard back in February when I attended a ‘Raptor Day’ he was running at the Elmley Reserve in conjunction with Greenwings Holidays. 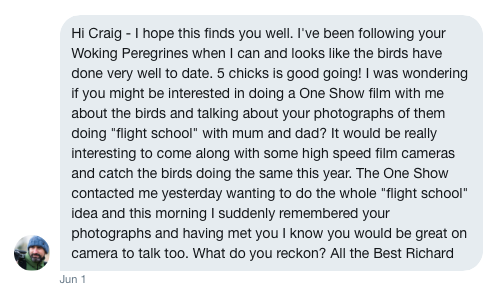 The subject of the Woking Peregrines came up in conversation, and so when Richard was approached later by the One Show to produce a film on Urban Peregrines, he remembered me and got in touch. He’d seen the food pass shots I’d taken, and was keen to capture the same behaviour. 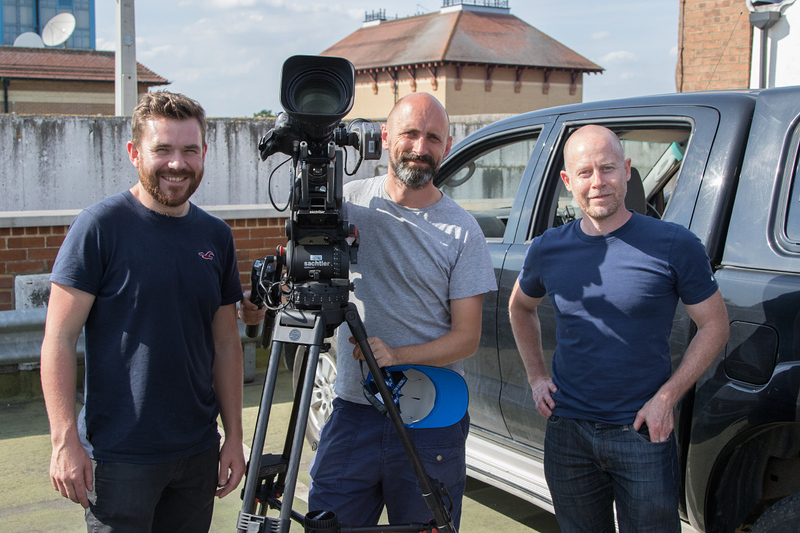 This was no easy task, and would require a lot of luck, but undeterred Louis Rummer-Downing and Guthrie O’Brien from the One Show came down with Richard on the 14th June to film the peregrines. By this stage all five of the juveniles had fledged, but only a few days before, so there was every chance it was simply too early. As luck would have it the weather was perfect, but after 3 hours sitting on the car park roof we’d had little to get too excited about. And then it happened. The Mum came in with a pigeon, and 4 of the 5 juveniles headed straight for Mum, screeching loudly as they approached. The Mum dropped the pigeon, and the juvenile directly below caught it, before dropping it when the second juvenile tried to grab it from below. 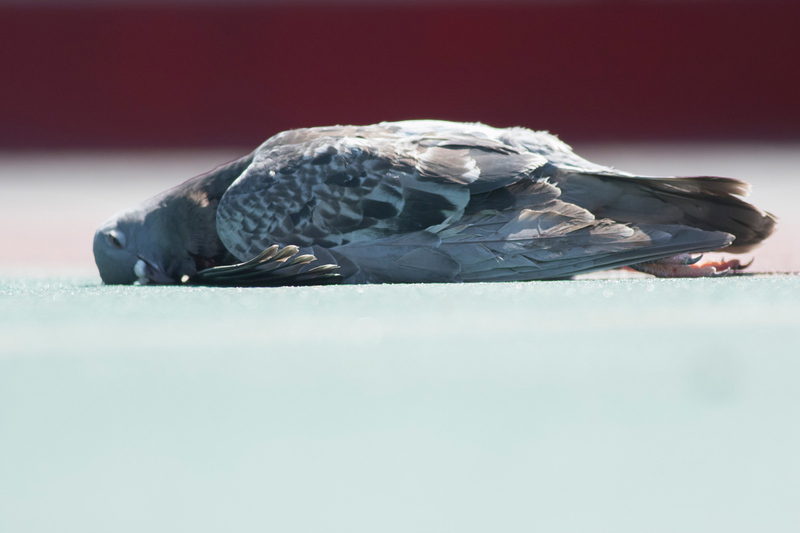 The manoeuvre ended in failure, with the pigeon ending up on the car park roof. Richard wasn’t sure if he’d managed to capture it successfully, and there was a nervous wait while they checked it on the computer. Thankfully it looked great, and I was mightily relieved that their trip to Woking wasn’t in vain. We then headed into the office so they could film me having the same conversation with Richard multiple times and from multiple angles, with all my work colleagues looking on! A fairly painful experience, but I got through it! Richard then headed out to the car park again to get some more footage, and while he wasn’t able to capture another food pass he got some great shots of their aerial acrobatics. 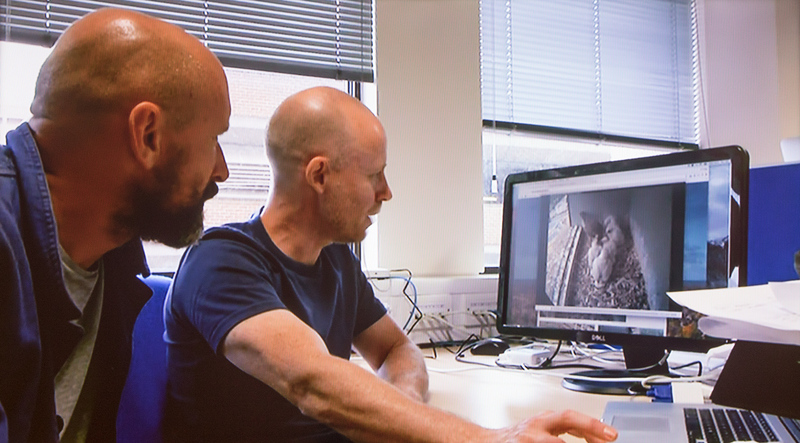 The show eventually aired on October 30th – a long wait but great to finally see the finished article. 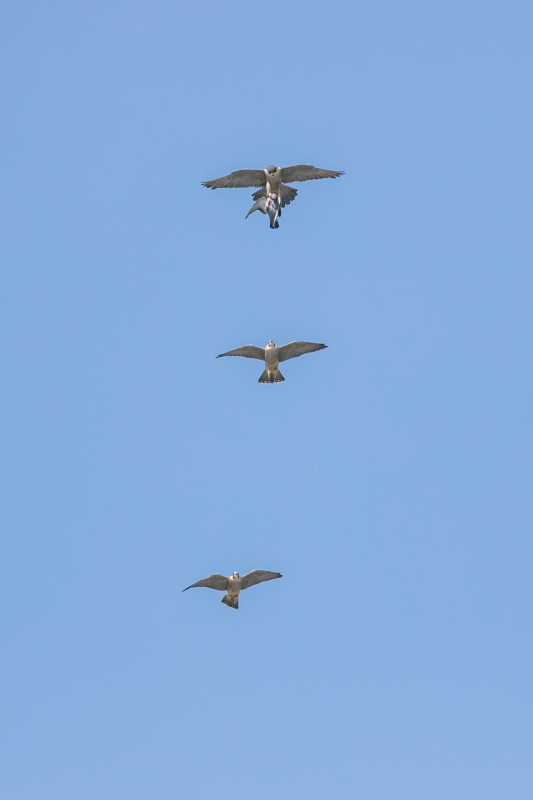 Some great exposure for my photography and some great publicity for the Woking Peregrine Project. For anyone who missed it (what the hell were you doing?) 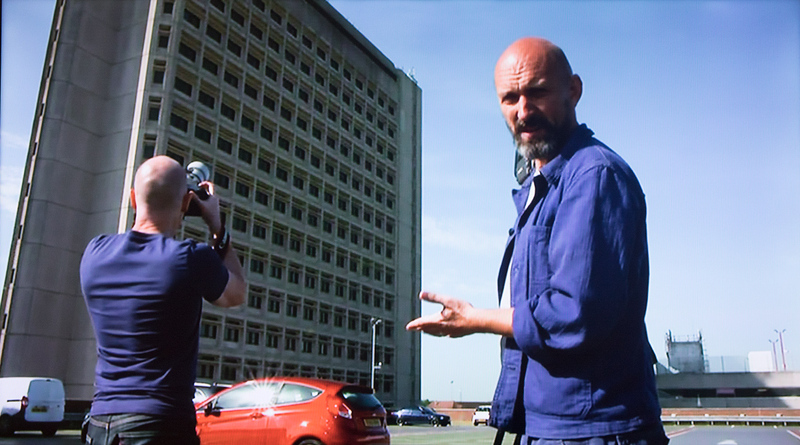 you can view it on iPlayer here.